Death doesn’t have to be all doom and gloom. In Ghana they like their coffins bright and colourful and in the shapes of everyday objects like coca cola bottles and shoes. In Ghana people believe that life doesn’t end with death – it continues in another form in another world. Each hand made coffin represents some aspect of the deceased – their work (many work as fishermen so fishes are popular), a hobby, obsession or vice. 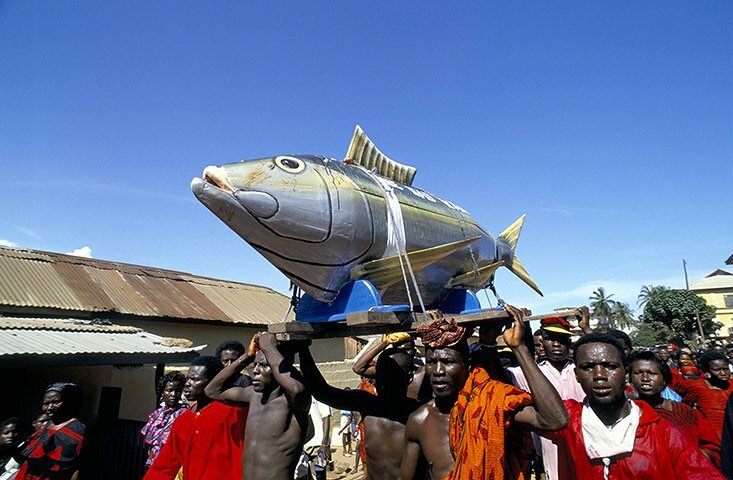 This strange tradition can be traced back to the Ghanian city of Accra, where in the 1950s a local artist named Kane Kwei began making novelty coffins. The Kane Kwei Carpentry Workshop continues to make coffins now but the industry has now expanded to many other artistic coffin workshops. Some coffins are now considered works of art – a coffin in the shape of Porsche car in 2014 sold for over nine thousand dollars at the Bonhams auction house in London.